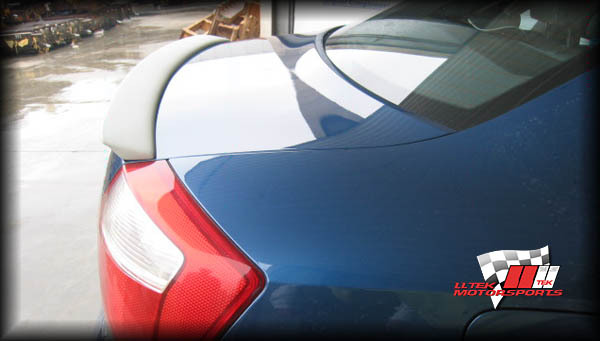 Rear Deck Trunk Spoiler - part# ICA48E-02 - (introduced Fall 2007) features RS Speed Styling Profile. LLTeK is pleased to present these images of UBERHÄUS Body Kits available from Europe! Take your time and explore this totally integrated kit - comprised of front lip spoiler, side skirts, rear valence, spoiler and matching roof spoiler. Please note the "quad" exhaust port in the rear valence - LLTeK has an exhaust configuration for you and a "dual" exhaust rear valence is also available. All components are available with LLTeK's MatchPaint option. This collection of aero styling is available in North America exclusively through LLTeK. The introduction - to the Audi community - of an entirely fresh set of modifications represents LLTeK's continuing and determined efforts to provide quality and diversity for Audi enthusiasts. UBERHÄUS is an Audi-only designer/manufacturer that devotes 100% of time and energy to quality and innovation. S4 8E Sedan Owners - Note: Trunk Spoilers may have compatibility/fitment issues - please call for clarification.